A crude version of Dark Magical Circle appears in this card's artwork. The scene this card depicts appears in the artwork of Summon Breaker. With "The Shallow Grave", it is treated as each player Special Summoning one monster. Thus, if "The Shallow Grave" is activated while "Summon Limit" is active, then afterwards each player can Summon one more time. : If "The Shallow Grave" is activated while the effect of "Summon Limit" is active, then it is treated as who Special Summoning what? If you already Summoned two or more times during this turn and if "Summon Limit" is activated, then you cannot Summon again. If "Summon Limit" is chained to your "Monster Reborn" during a turn in which you already Summoned two or more times, then "Monster Reborn" will not Special Summon a monster. : If "Summon Limit" is chained to "Monster Reborn" which is your third Special Summon, then can a monster be Special Summoned? 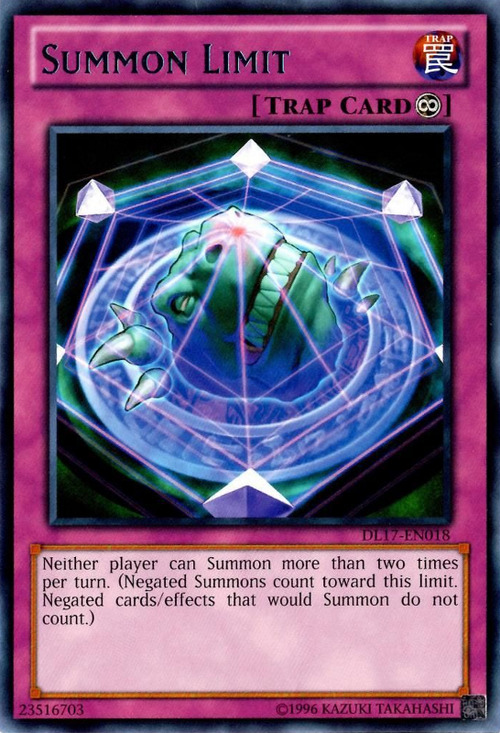 If the activation of "Monster Reborn" is negated by "Magic Jammer", then it does not count as one of the two Summons allowed by "Summon Limit". (You can Summon two more times this turn.) 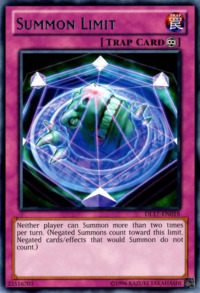 If the effect of "Monster Reborn" is negated by effect of "The Fabled Unicore", then it counts as one of the two Summons allowed by "Summon Limit". (You can Summon one more time this turn. ): While the effect of "Summon Limit" is being applied, if the activation or effect of "Monster Reborn" is negated, can you only Summon a monster once more this turn? The limit applied by "Summon Limit" includes Normal Summons, Flip Summons, and Special Summons. Summons performed before "Summon Limit" resolves are applied to the limit of 2 per turn. If you Flip Summon 3 monsters during your turn, you can activate "Summon Limit" afterwards in the same turn, but you cannot Summon any monsters for the rest of the turn.